Bored with chicken recipes (what else is new), but knowing I need to eat more protein (who cares if it is covered in cheese...at least it is fat free/reduced fat cheese), I found this recipe from Plain Chicken while researching Chicken with Mustard Cream Sauce. Being a big fan of pesto, but never actually cooking with it, I was excited to have it in my kitchen. This was FANTASTIC. Plain Chicken recommends serving with a side of pizza sauce and I do too. J ate his with a side of ranch. This made an awesome dinner, but would also be a great appetizer for any occasion. OH, and it is E-A-S-Y and took less than 30 minutes. Some would say I cheated because I bought pre-made dough, but whatever. I also bought pre-made pesto. One day when I get adventurous, and have a lot of spare time on my hands, I will make these things from scratch. But that's like saying I'm going to make my own cheese. Highly doubtful. Cook time according to Rachel: Under 30 minutes! Depending on the dough/flatbread you buy, prepare following directions on package. Plain chicken also bought pre-cooked Italian seasoned chicken. I bought raw & seasoned myself with Italian seasonings. If using raw chicken: heat very small amount of olive oil or use cooking spray in a large skillet. Chop up the chicken and sauté on medium-high heat until chicken is no longer pink. Insert picture of half baked dough, pesto, chicken & cheese...yeah, I forgot. I was doing laundry at the same time. Because I used pizza dough, the directions required me to pre-bake the dough for 6-8 minutes. 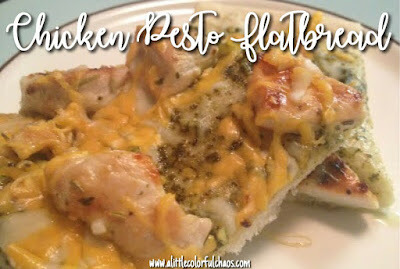 Then remove from heat and spread pesto, chicken and cheese onto the dough. Bake for an additional 6-8 minutes. Remove from heat when dough is golden brown and the cheese is melted. Of course, I ran downstairs to put my wash into the dryer and J removed the flatbread from the oven convinced it was done after 6 minutes. I probably would have cooked for another minute but it was still amazing. Slice and serve immediately.